The basic configuration has a Core i7 7700T Quad Core processor, no optical drive and a plain front plate. An alternative front plate can be fitted together with an internal DVD/Blu-ray drive. If you choose a DVD/Blu-ray option, then a different face plate is used, with an aperature for the slim DVD/Blu-ray drive. If the 16GB option is chosen the equivalent 2x8GB modules are used. The CPU and the motherboard chipset are cooled by using advanced heat pipes attached to both sides of the case. The heat pipes attach to the CPU via a copper heat transfer block. This technology provides efficient cooling by transferring the heat to the cooling fins on the outside. As a result you get a completely silent cooling solution that can be trusted. The cooling is so effective that even the Core i7 can be used at 100% CPU load continually without any overheating problems. The heatpipe cooling of the motherboard's chipset enables stable performance even under extreme loading. 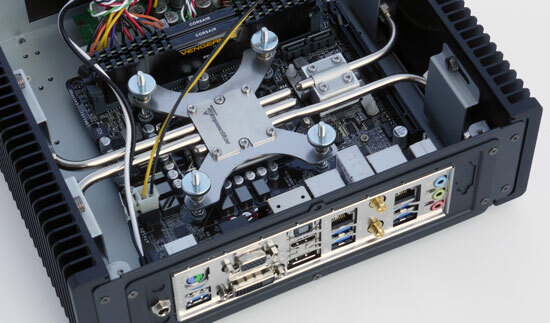 Cheaper fanless ITX cooling solutions rely on air cooling of the chipset which requires ventilation slots in those cases. Lack of air inlets also provides dust ingress protection.